It is still in progress. Do not merge yet. I can't build code on Android platform. Guys, if you someone can guide me how to make Android version functional i will be helpful. There is problem that all commands are called through wrapper function. But that function is defined as void function. So there should not be any return value. Any idea how to make it work without high code pollution? @rborn @alvelig got it. It works as you can see in first comment. Would be nice to get some code review response. @radeno man, awesome job! I had tested your fork, works brilliant! @rborn tested on Android device. iOS not tested. Merged with upstream. Hope will be merged. Want to add getZoom (need to investigate how to do that properly) or something like that. Than it will be easier to get visible all markers and so on. Callbacks are "hell", anyways is tagged as experimental. 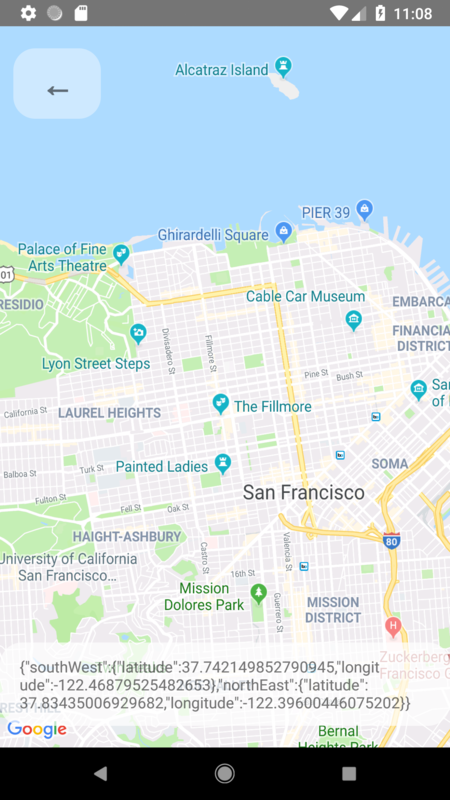 On Google Maps, more values are available: https://developers.google.com/android/reference/com/google/android/gms/maps/model/VisibleRegion - the farLeft, farRight etc. properties. Are these different values than are contained in the latLngBoundsobject? I can't quite tell if there is different information in those, or not. If so, is it worth it to return them as well? 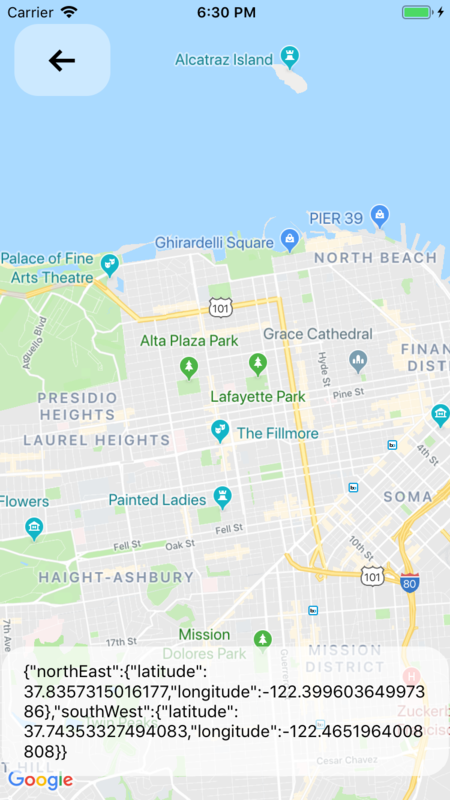 I am a little bit obsessive about exposing as much of the native map helpers as possible, and wouldn't like to miss out on available data which we later cannot include for backwards-compatibility reasons, thus requiring us to add yet another helper. @miracle2k if have MapKit same functionality then no problem to return it. But if it's only for Google Maps then it is not multiplatform. @radeno MapKit does not expose those fields directly, but it might be possible to calculate them ourselves. It might also be ok to only return those fields on Android. Still, I am not even sure if those fields contain any new information; the whole thing might be nothing. Can anyone currently running this PR check? @miracle2k ok, let me check what google maps returns. But as naming says i except it should be for camera view, when map is skewed (not 90° angle). @radeno can you say, please, what is the difference between your solution and this? Top is native calculated, bottom by region. So depends on Zoom, and just latitude coordinate is different. Third decimal place is 110m and Fifth just 1.1m. I don't make any deep investigation how internal SDK calculates it neither performance difference. It's look like computing bounding box from region is much cheaper and performant than native. 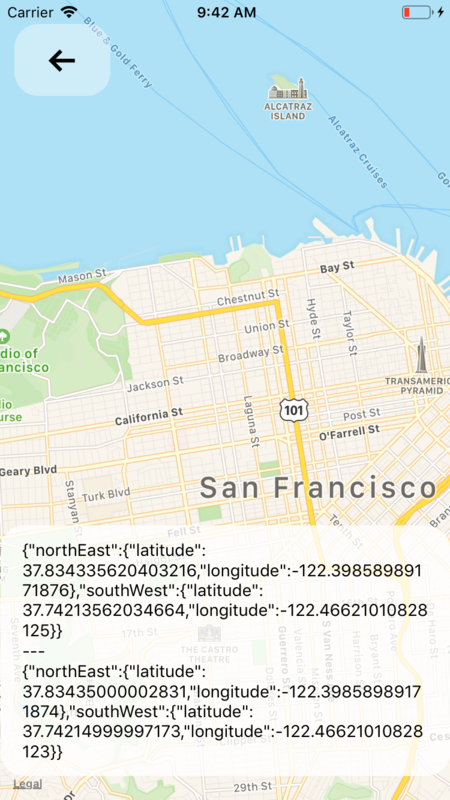 Because everytime is regionChanged https://github.com/react-community/react-native-maps/blob/c7a55f5e2b3b7854e248d35baf8dbd716a95350c/lib/ios/AirMaps/AIRMapManager.m#L837 then callback Region contains precalculated delta and then sum-up 3 numbers on JS side with simple operators is ultra-cheap. Almost 0 miliseconds. 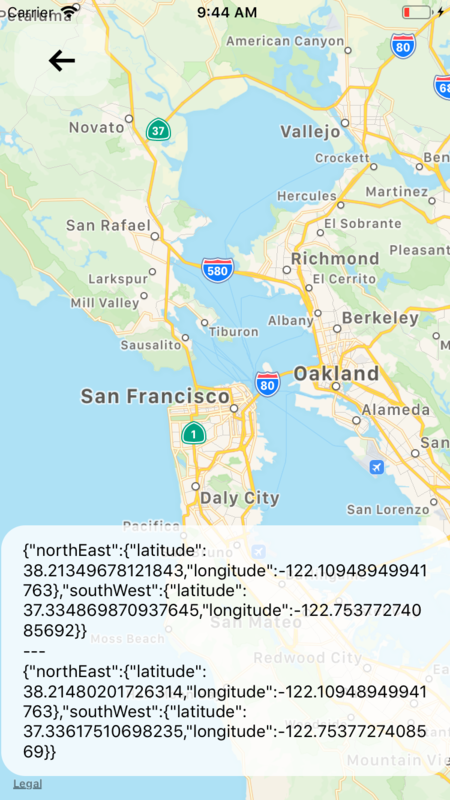 On the other hand native calculations through my PR should takes in average 250ms on MapKit and average 150ms on Google Maps. But should be more precise. I think we should also implement helper method which takes region as argument and returns bounding box. Something like coordinateForPoint method. But without promise. Because coordinateForPoint calls native method. Note there is currently no way to get the region from the map, except via the event. I do think an imperative way to access the region, getRegion() or getMapBoundaries() as in this PR is useful. @miracle2k you DO think or DON'T ? Right now, if I ever want to use the region in calculations, I have to setup a handler for onRegionChangeComplete or onRegionChange, then copy the region to local state (component state, or an instance member). 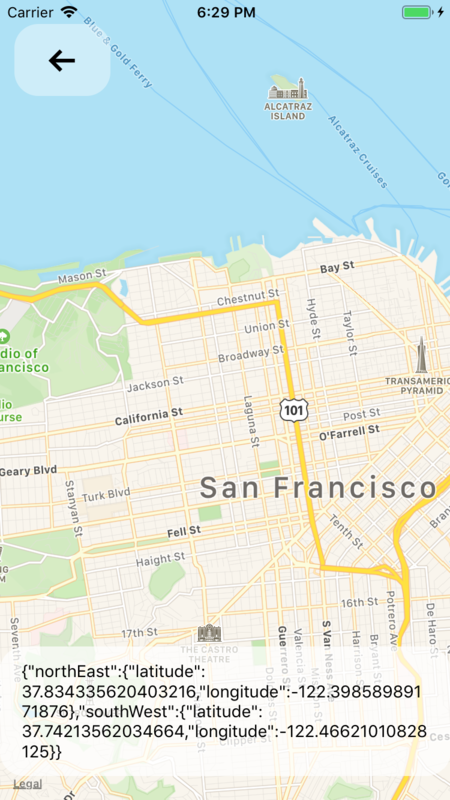 I think in many cases, where I only need to know the region in rare cases, for example when a user presses a "find button", I would think I would opt for calling this.refs.map.getMapBoundaries() at the time when I need that data, instead. @radeno I think @Peretz30 's suggestion for the name is valid, maybe you agree? @miracle2k you are right about getting bounding box without region change. On the other hand you want to pass region to method getMapBoundaries, which i think is very confusion. Why region? Or why pass any argument? Region is something "low level" how native maps works. As @miracle2k says, we don't have region in every event. So when we are forcing to pass region everytime, then it will have very limited usage. I think adding helper method like mapBoundariesForRegion is very self-descriptive. When i pass region i get map boundaries. Same idea as pointForCoordinate or coordinateForPoint But without promise. No need to be async function. @radeno , thanks for explanation. Now I see, your logic seems to be right and your function name suits better. Hi, thanks for the solution...Everything was working fine (i put some markers to test both coordinates, northEast & southWest), but when i rotated the map, the markers are showed in another position...How can this be fixed? there is no support for rotation?